It’s been rumoured for years, and now it’s finally official – Alfa Romeo is making a return to Formula 1 racing in 2018 after more than 30 years away from the sport. The company signed a multi-year technical and commercial partnership agreement with Sauber, and will see the team race in Alfa Romeo colours and logos and with up-to-date 2018 Ferrari engines. The Alfa Romeo Sauber F1 Team, as it will be called, will form a strategic, commercial and technological cooperation with the Milanese carmaker in all applicable areas of development, including access to engineering know-how and expertise of Alfa Romeo technical staff. There will be additional opportunities for the two companies in both Formula 1 and the automotive sector in general, says Alfa Romeo. 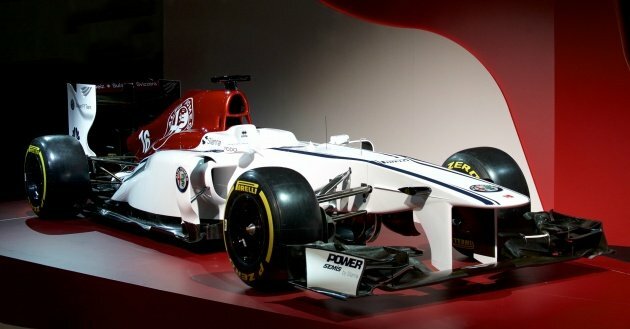 A new livery was revealed over the weekend on a 2013 Sauber C32, with a red and white colour scheme featuring large Alfa Romeo logos on the nose and engine cover. The team has also revealed that its current test driver Charles Leclerc, a Monégasque racer from the Ferrari Driver Academy who won this year’s Formula 2 championship, has been promoted to a full-time seat alongside Marcus Ericsson starting in 2018. Alfa Romeo. Style come first, results second. Sauber went from a primary works team (BMW sauber) to junior works team now (Alfa Sauber), becoming feeder club to Felali. They have been doing this long time ago. Not really. When under Peter Sauber control, he still has a lot of say, but when under partner team (ie BMW sauber), he lost all control. Now it went back to that era again. Only true on yesteryear 12 years old and above Alfa Romeo ancient models. Have you owned and drives the 4C or Giulia QV or even the Giulietta? I am guessing yours are GM derived 159 or Brera right? Other than those models are too old already subjected to wear and tear my amigo! Gud question asked. Have U OWN or Driven a 4C or Giulia QV/Giulietta ??! I don’t own anymore Alfa. Those who own a Giulia or Giulietta don’t bother to read/comment here bcos only the owner knows what is the REAL Problem. As for the 4C, I can bet U NEVER own/driven one. Cheers… to Real Alfa owners. How many sister teams do they want? It seem like they are trying to control more teams in F1 for better bargaining power. Who is the engine supplier? Read First Paragraph, last line. Niceeeeee. But unfortunately it still remains a boring watch and the engines still sound like they went to Brothers And installed Ah Beng exhausts. Pascal Picci talked about history, but there’s No quadrifoglio at the side of the car. The Alfa logo is a family crest that shows a serpent swallowing a colored person, strongly presumed to be a muslim. How this blatant racism can go unnoticed or held accountable is beyond me. It’s all over google. The Alfa logo is a family crest that shows a serpent swallowing a colored person, strongly believed to be a muslim. The original works have the man colored brown. It is the crest of the Visconti family during their crusades against the moors from syria. However, Alfa says the snake is not swallowing a person but rather, giving birth. Obviously this is refuted by many experts. How this blatant racism can go unnoticed or held accountable is beyond me. It’s all over google. Will they use current Ferrari power unit or year old one? Or the old PU, modded by Alfa Romeo. I drive an Alfa and it’s just brilliant. Yes it’s stylish but god it performs. Fabulous engineering. In short, Ferrari will always be the No1 sports car in Fiat Group. Alfa/Sauber will act as the supporting No2 in F1. I’m speaking Metaphor: a figure of speech. What U are doing is called Splitting Hair. Who do not know your brother is a Man ie if U have one ! Adios Amigo ! !